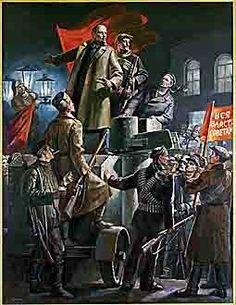 The socialist character of Soviet, i.e., proletarian, democracy, as concretely applied today, lies first in the fact that the electors are the working and exploited people; the bourgeoisie is excluded. Secondly, it lies in the fact that all bureaucratic formalities and restrictions of elections are abolished; the people themselves determine the order and time of elections, and are completely free to recall any elected person. 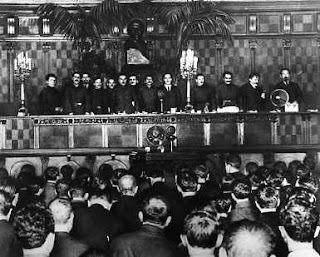 Thirdly, it lies in the creation of the best mass organisation of the vanguard of the working people, i.e., the proletariat engaged in large-scale industry, which enables it to lead the vast mass of the exploited, to draw them into independent political life, to educate them politically by their own experience; therefore for the first time a start is made by the entire population in learning the art of administration, and in beginning to administer. These are the principal distinguishing features of the democracy now applied in Russia, which is a higher type of democracy, a break with the bourgeois distortion of democracy, transition to socialist democracy and to the conditions in which the state can begin to wither away. It goes without saying that the element of petty-bourgeois disorganisation (which must inevitably be apparent to some extent in every proletarian revolution, and which is especially apparent in our revolution, owing to the petty-bourgeois character of our country, its backwardness and the consequences of a reactionary war) cannot but leave its impress upon the Soviets as well. We must work unremittingly to develop the organisation of the Soviets and of the Soviet government. There is a petty-bourgeois tendency to transform the members of the Soviets into “parliamentarians”, or else into bureaucrats. We must combat this by drawing all the members of the Soviets into the practical work of administration. In many places the departments of the Soviets are gradually merging with the Commissariats. Our aim is to draw the whole of the poor into the practical work of administration, and all steps that are taken in this direction—the more varied they are, the better—should be carefully recorded, studied, systematised, tested by wider experience and embodied in law. Our aim is to ensure that every toiler, having finished his eight hours’ “task” in productive labour, shall perform state duties without pay; the transition to this is particularly difficult, but this transition alone can guarantee the final consolidation of socialism. Naturally, the novelty and difficulty of the change lead to an abundance of steps being taken, as it were, gropingly, to an abundance of mistakes, vacillation—without this, any marked progress is impossible. The reason why the present position seems peculiar to many of those who would like to be regarded as socialists is that they have been accustomed to contrasting capitalism with socialism abstractly, and that they profoundly put between the two the word “leap” (some of them; recalling fragments of what they have read of Engels’s writings, still more profoundly add the phrase “leap from the realm of necessity into the realm of freedom”. The majority of these so-called socialists, who have “read in books” about socialism but who have never seriously thought over the matter, are unable to consider that by “leap” the teachers of socialism meant turning-points on a world historical scale, and that leaps of this kind extend over decades and even longer periods. Naturally, in such times, the notorious “intelligentsia” provides an infinite number of mourners of the dead. Some mourn over the Constituent Assembly, others mourn over bourgeois discipline, others again mourn over the capitalist system, still others mourn over the cultured landowner, and still others again mourn over imperialist Great Power policy, etc., etc. The real interest of the epoch of great leaps lies in the fact that the abundance of fragments of the old, which sometimes accumulate more rapidly than the rudiments (not always immediately discernible) of the new, calls for the ability to discern what is most important in the line or chain of development. History knows moments when the most important thing for the success of the revolution is to heap up as large a quantity of the fragments as possible, i.e., to blow up as many of the old institutions as possible; moments arise when enough has been blown up and the next task is to perform the “prosaic” (for the petty-bourgeois revolutionary, the “boring”) task of clearing away the fragments; and moments arise when the careful nursing of the rudiments of the new system, which are growing amidst the wreckage on a soil which as yet has been badly cleared of rubble, is the most important thing. The fight against the bureaucratic distortion of the Soviet form of organisation is assured by the firmness of the connection between the Soviets and the “people”, meaning by that the working and exploited people, and by the flexibility and elasticity of this connection. Even in the most democratic capitalist republics in the world, the poor never regard the bourgeois parliament as “their” institution. But the Soviets are “theirs” and not alien institutions to the mass of workers and peasants. The modern “Social-Democrats” of the Scheidemann or, what is almost the same thing, of the Martov type are repelled by the Soviets, and they are drawn towards the respectable bourgeois parliament, or to the Constituent Assembly, in the same way as Turgenev, sixty years ago, was drawn towards a moderate monarchist and noblemen’s Constitution and was repelled by the peasant democracy of Dobrolyubov and Chernyshevsky. It is the closeness of the Soviets to the “people”, to the working people, that creates the special forms of recall and other means of control from below which must be most zealously developed now. For example, the Councils of Public Education, as periodical conferences of Soviet electors and their delegates called to discuss and control the activities of the Soviet authorities in this field, deserve full sympathy and support. Nothing could be sillier than to transform the Soviets into something congealed and self-contained. The more resolutely we now have to stand for a ruthlessly firm government, for the dictatorship of individuals in definite processes of work, in definite aspects of purely executivefunctions, the more varied must be the forms and methods of control from below in order to counteract every shadow of a possibility of distorting the principles of Soviet government, in order repeatedly and tirelessly to weed out bureaucracy.